Boho hairstyles are so irresistible – they have the charm, the elegance, the simplicity that makes these hairstyles so perfect that you want to wear them every day and not just for your big day. 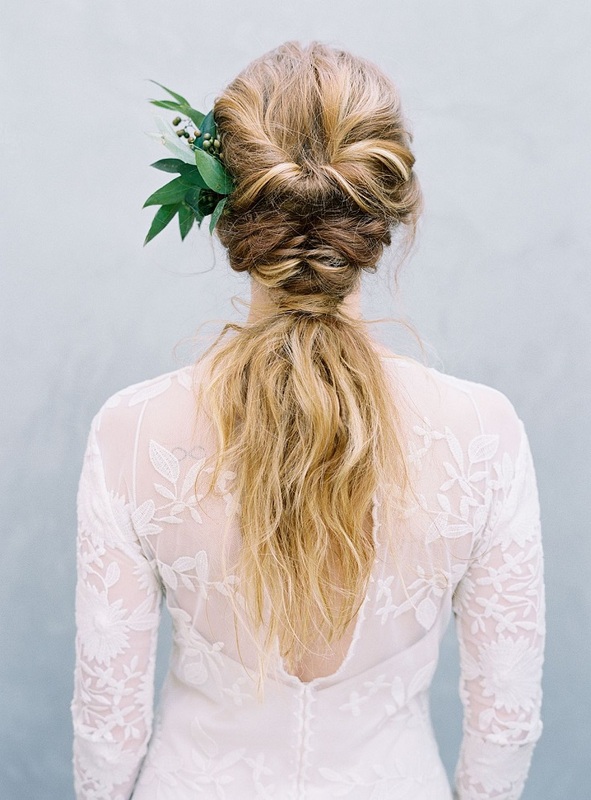 Below you will find ten examples of boho hairstyles that you can wear at your wedding day. There are so many of hairstyles that it was so hard to pick just ten, but we finally made our choice – we hope you’re going to like them and if you do, save them for a wedding! 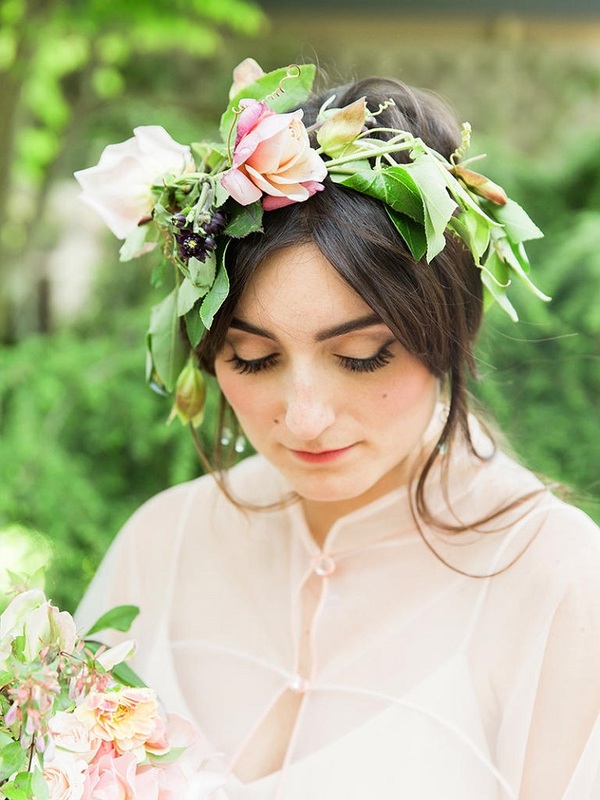 One of the most popular, if not the most popular of all boho hairstyles is the one where you keep your hair down, messy with loose curls and you’re wearing a flower crown. This is perfect if you don’t want anything spectacular for your big day, but still want to look as the bride. It’s so simple and maybe that is even the reason why it’s so gorgeous! Tiny flowers don’t satisfy your boho cravings? We totally understand you! To make your wish come true, just choose a hair accessory that includes a big, blossoming flower. It can be a flower crown like on this picture, or it can be just a flower comb – this depends on your preferences. 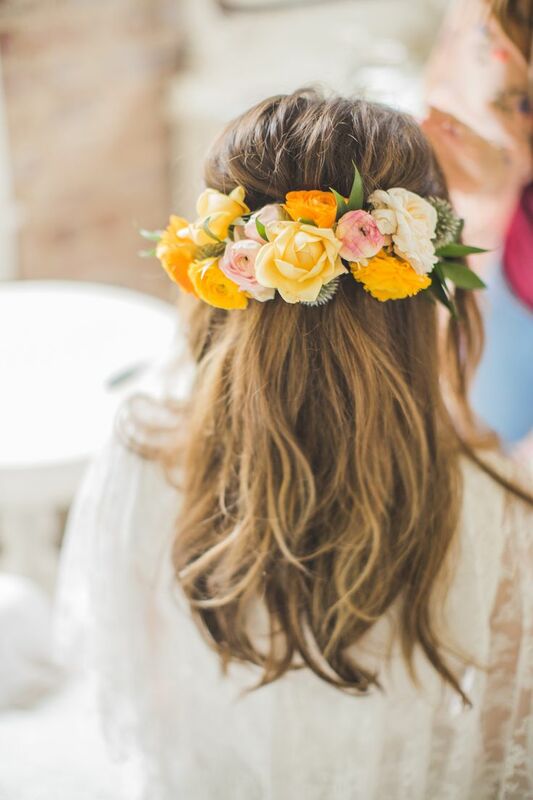 Having big flowers in your hair will leave you unnoticed and we’re sure that everyone would admire your hairstyle. Having curls for your wedding day is a very popular choice among brides, but to make the hairstyle appear more of a boho, you can just add an accessory. Take this picture for an example – it is elegant, classy, it isn’t that messy, but it has that boho charm. This hairstyle works perfectly on long to medium hair length. To escape the everyday, ordinary look of the braid you will need to upgrade it a little bit. 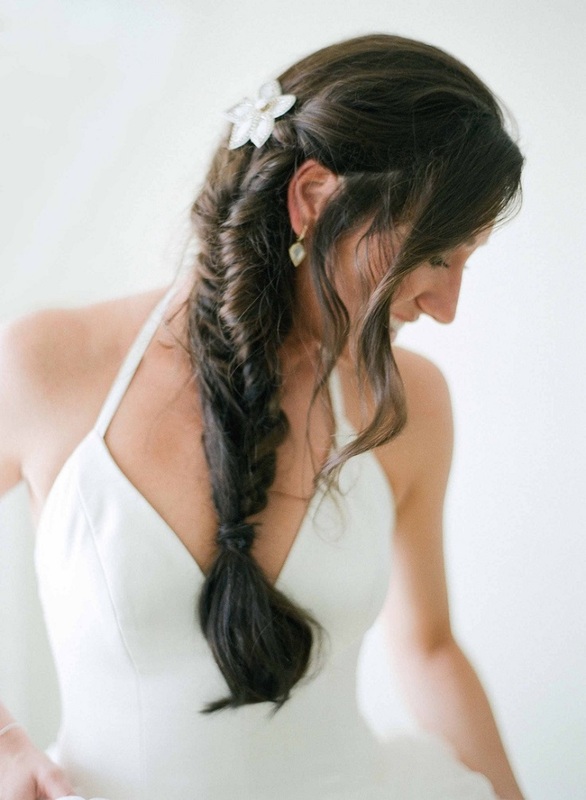 There are tons of braid variations that can work out just fine for weddings, but we chose the fishtail braid as our favorite. 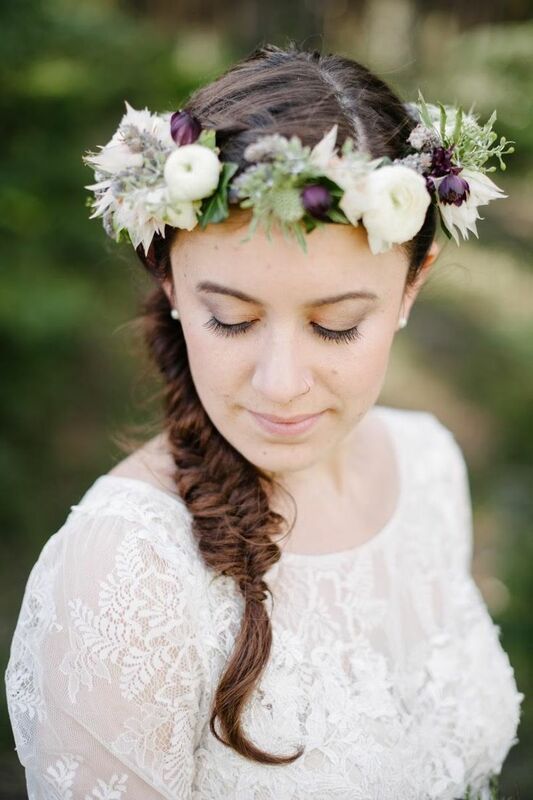 It totally fits the messiness of the boho style, yet it still looks elegant enough for your big day. Having a messy hairstyle sometime isn’t enough. Many women decide to upgrade their hairstyle look with a certain accessory, make it a flower crown, a comb or a headband. There are many options and when it comes to the boho style, most of the times these accessories are nature – inspired, with flowers or leaves. 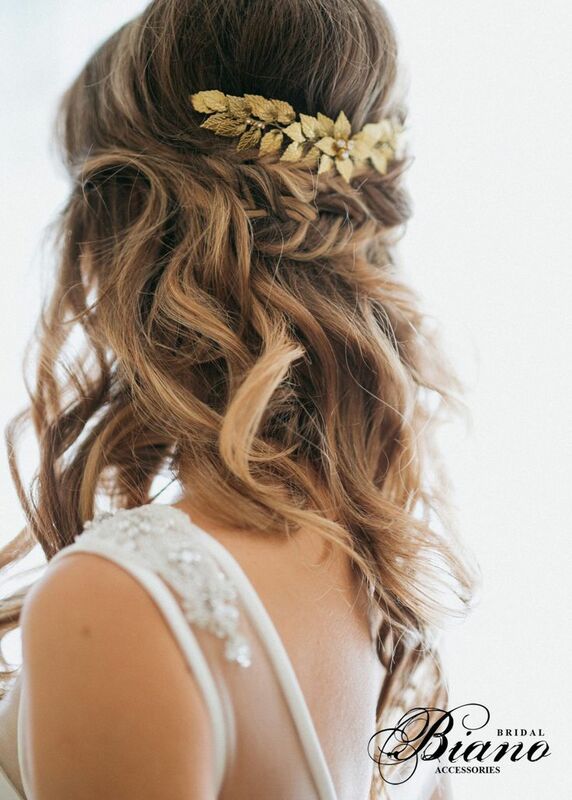 Take this accessory for an example – gold leaves accessory on a curly hairstyle with braids. Looks amazing, right? Side braids are really elegant, but unfortunately they look the best on longer hair (fortunately for those who have it!). Instead of regular braid, you can ask for a messy fishtail. You can leave pieces of hair from each side to get an extra messier look, while to make it more boho, add a floral crown or headband. We love this look! Messy braid with a messy ponytail – can this look get any more boho? Well, it can if you add a flower crown or other flower accessory! 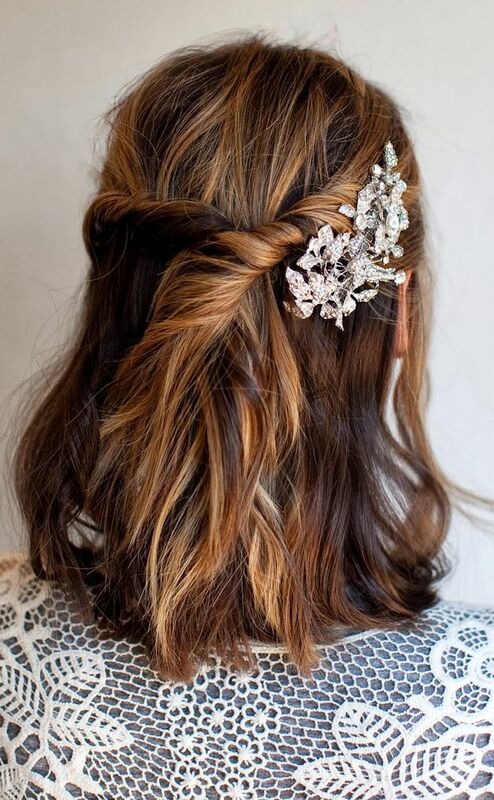 This is such a stunning hairstyle and we’re sure that if you go for this look, each of your guests will be amazed of it! It’s very chic and keeping your hair behind means that you can wear earrings as your focus accessory. Low buns are one of the most popular hairstyles for weddings. They work perfectly on long to medium length hair and can be easily transformed into a boho hairstyle if the bun is messier. 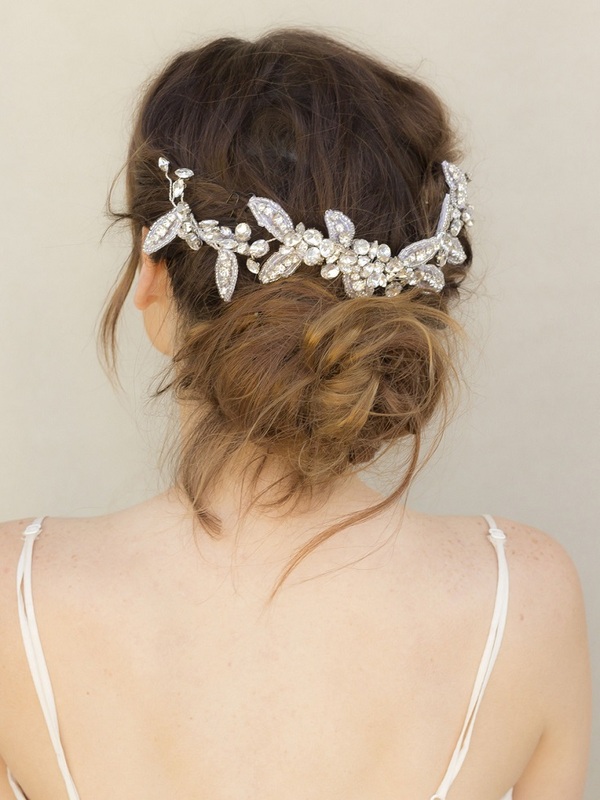 Add an accessory and you have one of the most gorgeous – looking hairstyles ever. It will work on every wedding style, no matter if it’s boho, rustic, romantic, you name it. 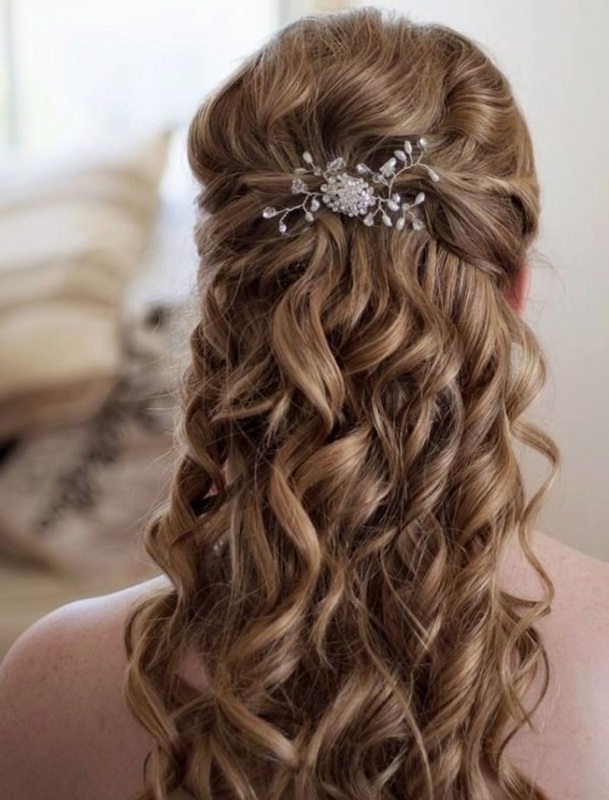 The hairstyle that is one of the biggest hair trends in the past few seasons can be easily transformed into a beautiful wedding hairstyle as well. Many are afraid that having shorter hair would mean less choice, which is partially true, but it doesn’t mean that you don’t have options at all. In fact, the bob is so stylish just by itself and adding a detail or upgrading the look with twisted pieces of hair such as these would totally work out even more than fine. Half-ups are a simple hairstyle that can even work on medium to short length hair. 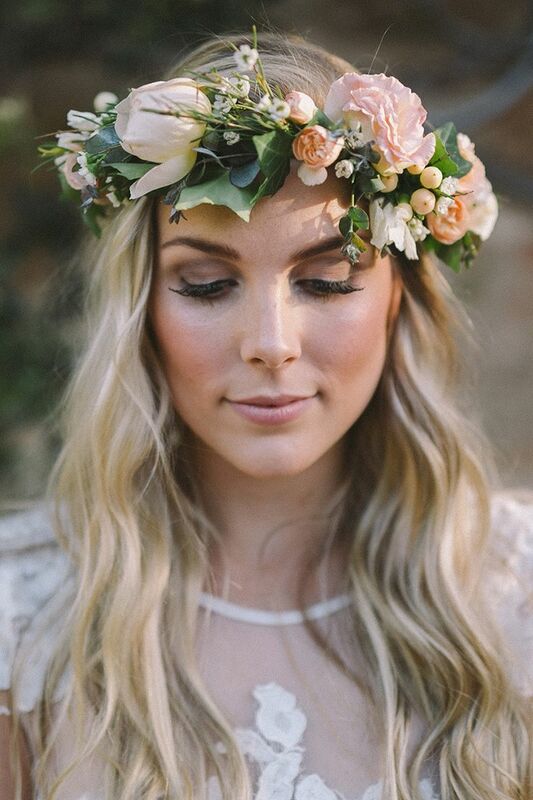 Secure the half-up with a boho accessory, such as the flower crown and instead of going for rose, white or any other “typical” wedding colors, how about for something more unique? As you can see, yellow flowers are such bright, interesting detail!